As detailed in my previous posts I have been trying to come up with a solution to the problem of lengthy combats leaving certain people out, I decided to ‘test run’ a number of ideas this evening with the results shown below. Each player makes a roll for their engines and weapons score and totals the final results together to equal the damage done to the other side, each side then rolls their trade score to represent their attempts to repair their ship and subtracts it from the damage done. Each player rolls for their engines, weapons and trade, totalling the rolls and this gives the dmg done to the other side. Total up Engine, Weapon & Hull scores and then add a 4DF roll, this gives you the damage done to other side. This would be run more like a normal attack roll with each ship making a weapons roll vs the other ships hull roll and the number of shifts being the amount of damage caused. All of the ideas proposed so far have their individual merits and flaws, however their main flaw in my opinion is that that they all effectively involve adding a variety of stats together and then adding a dice roll as a randomiser; whilst this has a certain amount of logic to it given that this is how most challenges work in numerous roleplaying games, the various methods proposed above seem to result either in both ships taking crippling levels of damage or barely anything at all. If the players exceed the difficulty then they have forced the enemy to surrender (unless they are particularly zealous in which case they are destroyed), if the player ties on the roll then either the combat ends in a stalemate with both sides withdrawing to lick their wounds or the players win but at a heavy cost. If the players win by 3 shifts or more then they have succeeded with style and may choose to destroy the enemy vessels if they wish; however if the players lose then they have been defeated, if they fail by 3 shifts or more then the enemy have beaten them in style and the consequences may be severe. Venerus vs 1 pirate hazeroth cruiser. Not enough to defeat the enemy fleet. This is a stalemate, so either both sides retreat to lick their wounds or the Venerus wins but at a high cost. The Venerus has beaten the difficulty by more than +3 and so they have defeated it With Style and can choose to destroy the enemy if they wish. Venerus vs 3 pirate hazeroth cruisers. The Venerus has lost by more than 3 shifts and so they are at the mercy of the small pirate fleet. Venerus + Lunatic Pandora vs 3 pirate hazeroth cruisers.. The Venerus and Lunatic Pandora are narrowly defeated by the pirate fleet. The Venerus and the Lunatic Pandora have defeated the pirate fleet. Out of all the ideas that i’ve suggested in this post the final one is the most appealing, reducing the combat to a single test with a difficulty set by the quality of the opposition and modified via fate points, Aspects and Stunts as per normal tests (although this is not reflected in the tests shown above). I certainly plan to test out Idea 5 a game situation at some point, the only thing left to be decided on would be how to adjudicate the amount of damage done to the defeated fleet and the victors; although I am half tempted to leave this to narrative fiat. The space combat should be short/quick enough so that any people not involved are not sat out of the game for an extended period. It should involve a series of rolls rather than just a single dice roll. The navigator piloting the ship moving the ship. The Lord Admiral making the shooting rolls. The Enginseer making rolls to repair. Alternating people making rolls for the other fleet ship (crewed by NPCs). I made an attempt to have players whose characters hadn’t acted in the last round roll dice for the NPCs to keep them involved, however, I can appreciate that rolling a few dice isn’t the same as having your character actually involved in the situation unfolding, the same level of emotional investment isn’t present IMO. There were occasions when people whose characters weren’t directly involved used their abilities or fate points to help provide bonuses to those people (whether PCs or NPCs) who were making the rolls. Another (very valid) point that was raised after the session was that when people were suggesting compels for their Aspects in order to gain Fate points, only the person gaining the fate point was actually benefiting, however, in a lot of cases the complications arising were affecting or stymieing the efforts of other players who were not benefiting directly from the accumulation of fate points. The ships pilots position their ships, this provides a modifier to the next stage for whichever ship gains the advantage. Rolls are made for ships weapons, the number of shifts providing the total damage done to the opposing side. Repair rolls are made, the number of positive shifts repairing the amount of damage done. The amount of positive/negative shifts that each ship has remaining will be totaled and each side in the conflict will tally up their totals. Total damage is allocated to the various ships by the commander of each side in the conflict. The side with the least positive shifts in total is “Taken Out”, if they’ve taken a lot of damage then they may have been destroyed, or they may have been forced to surrender. This should allow a combat to be kept reasonably simple and short and on a narrative basis with a number of dice rolls that can occur simultaneously. In terms of Compels, I believe this is something that I can solve through my GMing by assuring that the complications arising from Compels are more personal and directed at the the character of the player receiving the fate point. So how did the game go? Expanding the repertoire of potential actions available to include more characters – this is one possibility but also involves adding an additional layer of complexity to the combat that I am keen to avoid. Have the players who are not involved take over the parts of named NPCs who are influencing the combat – again a possibility although i’d really love to keep players as their own characters as much as possible. Reduce the combat to a single roll or short series of rolls allowing all the player characters to contribute fate points – this is currently my favourite option since it reduces the length of combats meaning that players wouldn’t be sat out for so long but the potential of a single drastically bad roll would be mitigated by the potential fate point expenditures. Run each space combat as a series of small encounters involving all characters, the result of each encounter adding to the overall success or failure of the overall combat. I have a month to think about it before the next session, so i’ll definitely be giving some thought to potentially using one of the above options when we next have cause to run some space combat. 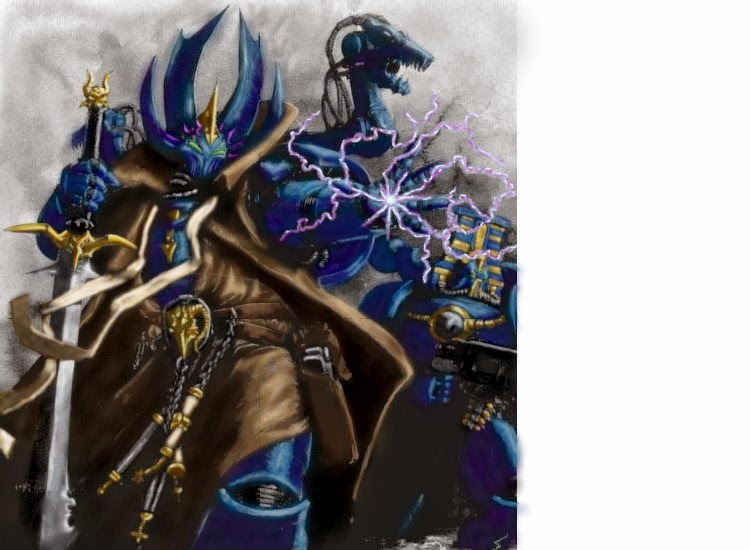 Having not long finished work on my post about ways to simplify space combat rules in my Rogue Trader FATE hack my thoughts started turning towards how initiative would would in the posited three zone space combat and how people would actually leave combat if they decided to flee rather than fight to the “death” (although obviously, the ship being “Taken Out” would not automatically mean death, more likely they have been boarded or are spiraling towards the surface of a planet, something more interesting like that). 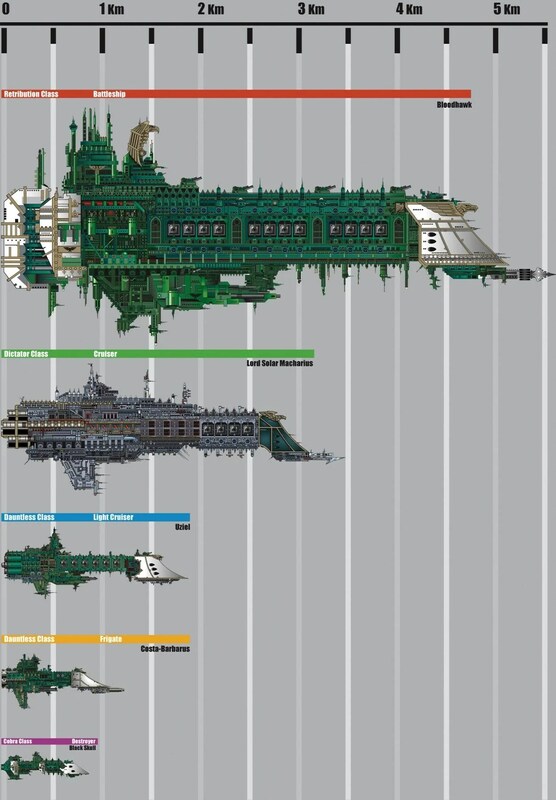 The two ships (Lunatic Pandora and Venerus) commanded by the player characters would be about the size of a Hazeroth Class Privateer and a Dictator Class Cruiser respectively (as shown in the image above) and, despite not being as vast as the hugest of the ships commanded by the Imperium of Man, they are still fairly massive vessels (coming in at a length of 1600m and 3500m). This was fairly straight forward, the ships would make rolls using their Engine Skill or (if a PC or named-NPC was crewing that station) their Drive(spacecraft) Skill and then would take their moves in turns from highest to low, these could be modified as usual using Aspects or (if appropriate) Stunts. For example: someone might have an Aspect of Advanced Scanners and spend a fate point to add +2 to their initiative because they’ve been able to pick up the other vessels and react sooner. 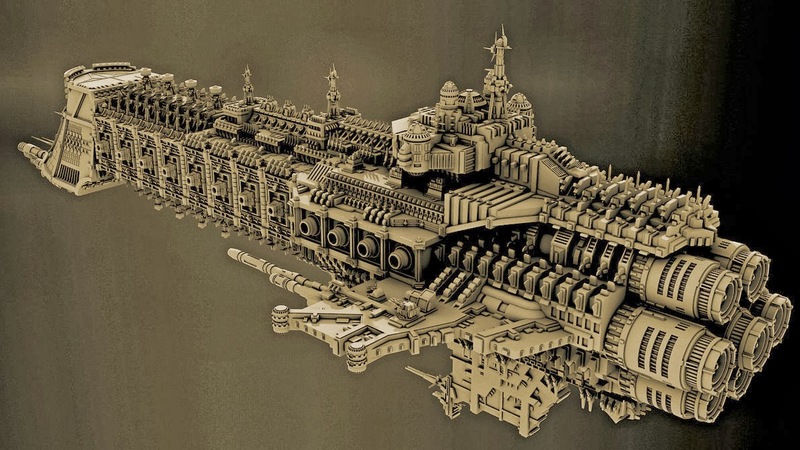 The most likely way of fleeing the area completely in a WH40K space combat (IMO) would be for the ship to activate its warp engines and and drop into the Immaterium; with this in mind I decided that any ship that did not have an enemy vessel in it’s zone could make a Fair (+2) Engine roll (or, if crewed by a player or named-NPC the Navigator could make the same difficulty Will roll) to enter the warp and leave the combat.